(4) To promote the use of the retriever gun dog in the hunting field as a primary means of reducing the cripple losses to a minimum, thereby resulting in the conservation of game birds and finer enjoyment of the hunting sport. HCARC for many years held five or six informal field trials each year. Stakes were Puppy, Hunters Special, Derby, Qualifying and Open. HCARC held its first AKC licensed field trial at BRG in 1993. It added a second licensed trial in 1998. Today its two licensed trials are held in May and September. The Minnesota Field Trial Association was organized in 1937, formally incorporated in 1939 and has functioned continuously since then as a member club of the American Kennel Club. 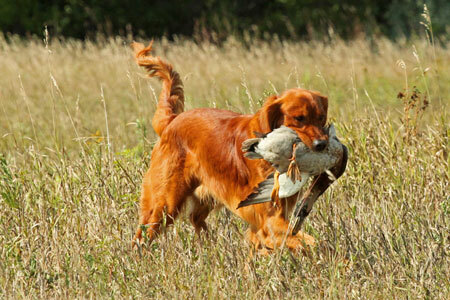 MFTA also is a member of The National Retriever Club and The National Amateur Retriever Club. MFTA is "an organization of sportsmen with a strong interest in hunting, conservation and especially the use and advancement of the pure-bred retriever breeds of dogs. The primary activity of the Association is to conduct AKC-member retriever field trials where the capabilities and accomplishments of the pure-bred retriever can be demonstrated." MFTA's first trial was held in Winona, MN, in 1938. Thereafter, trials were held at various locations in Minnesota. After formation of Benton Retriever Grounds, MFTA moved its trials to BRG beginning in 1991. It holds two licensed trials, in May and September.